Minor misses on sales and profit expectations sent this small-cap stock way down on the month. What: 3D cinema technology company RealD (UNKNOWN:RLD.DL) saw its stock sink 25% during the month of August, according to S&P Capital IQ data, bringing shareholders to about where they were one year ago. The stock is underperforming the market so far in 2015, down 14% compared to a 6% loss for the S&P 500. 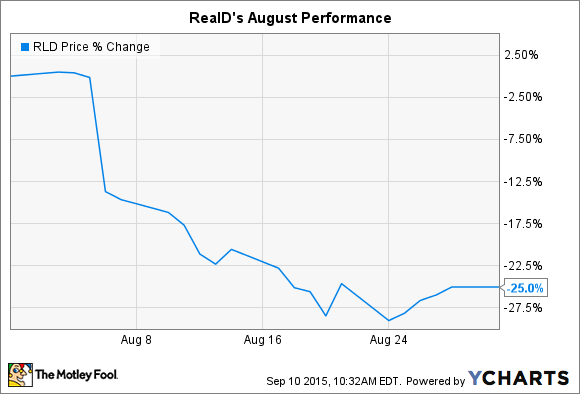 So what: RealD's second-quarter earnings announcement, released on Aug. 5, was the catalyst for August's sell-off. The good news in that report included the fact that RealD managed to swing to an operating profit from losses in the prior quarter and in the past fiscal year. RealD earned $10 million in the second quarter, translating to $0.14 per share, compared to a $14 million loss a year ago. But Wall Street expected more. Analysts had forecast $0.17 per share in profit. The pros were also surprised by RealD's 3% second-quarter sales dip, as they were looking for a slight revenue boost instead. Still, there was plenty to like about the quarterly results. For one, RealD experienced growing demand for 3D film experiences on titles like Jurassic World. Despite significantly fewer 3D title releases, second-quarter box office revenue rose 7% to reach $842 million. The company is also seeing strong gains in China, the world's fastest-growing theater market. China leaped to 18% of RealD's license revenue in the second quarter, up from 14% a year ago. Meanwhile, its worldwide base of 3D cinemas continues to inch higher, rising 5% to 27,000 theaters. "With our global cinema platform established, we are well positioned to deliver strong RealD box office and improved operating leverage," CEO Michael Lewis said in a press release. Now what: There are good reasons to expect better results over the next few quarters as a string of likely blockbuster movie releases drives 3D movie demand higher. Next quarter brings fresh launches in the Hunger Games and Star Wars franchises, and RealD should see a big close to its fiscal year as Batman v. Superman: Dawn of Justice comes out in late March. So investors shouldn't read too much into August's stock price dip. The business is improving, even if it's not growing quite fast enough to satisfy Wall Street right now. Is the RealD Experience Still Relevant?